​Ken has been playing at Adelaide wedding ceremonies for over 10 years. 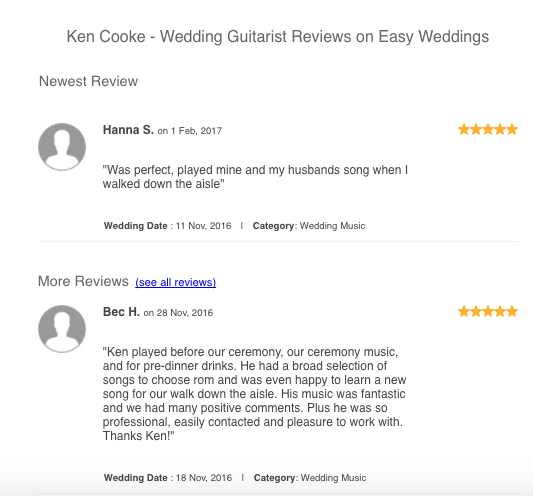 Able to play indoors or outdoors (totally acoustic or using portable amplification), Ken's solo guitar sound can provide the perfect ambience for your special day. As well as metropolitan locations, Ken is also happy to travel to McLaren Vale, the Barossa Valley and the Adelaide Hills regions. 20-30 minutes recessional music, during photos/drinks. A 'standard' ceremony performance price (within metro Adelaide) is $300.00. Please visit the price page here for all of Ken's rates. Ken's song list contains music from all genres. His 'wedding favourites' list contains a wide range of traditional and popular songs. There are also plenty of songs to choose from for your 'pre-dinner drinks/cocktail hour', if required. As most wedding guests' ages range from children to senior family members, you'll find a variety of music on Ken's song list to keep everybody happy. Please click here for all my pricing information. Can you play on the beach ? Yes, no problem. I can play anywhere, due to my portable amplification. I have played some beautiful weddings recently at Henley, Glenelg and Semaphore beaches. No, I play solo guitar only. What songs should I choose for the 'pre' and 'post' ceremony music ? For the pre-ceremony (Prelude), I would suggest more of the slower tempo numbers, to help build a relaxed atmosphere - and choose music which will appeal to the wide age group attending your wedding. It's always good to play a song or two that your Grandparents and Aunties & Uncles will enjoy too (they're the ones that usually arrive the earliest!) - and remember that the bride isn' t there for the Prelude, so you may want to let the groom choose some for this part! I am happy to assist you with any ideas you have for your music. When do you actually 'play' at my wedding, and how will you know 'when' to start playing for the brides' arrival? The bridal party's arrival. I usually get my cue from the celebrant, as to when to start playing. I can make your bridal arrival song just the right length, to be timed perfectly with your walk down the aisle. You may also want a separate song for your bridesmaids, if you have more than 2, but it is not essential. pause in music not only creates a little atmosphere, but it also helps to quieten the guests for your arrival. I play 1-2 songs as you sign the register, and photos are taken etc. I can also play a requested song as you are declared 'husband and wife' - it's up to you. I generally play for 15-20 minutes after your ceremony, as you mingle with your guests during photos, drinks and celebrations. Arrangements can also be made to have me play at your 'pre-dinner' drinks, for an hour before your reception. ​How about adding some light guitar music to your pre-dinner drinks ? Background music is a great way to break the ice and get your guests mingling, it can also help to create a wonderful ambience. ​From jazz & blues to classic pop, lounge and latin, Ken's solo guitar playing can provide the perfect chilled backdrop. Featuring such tunes such as : All Of Me. Moondance, Come Fly With Me, Blue Moon, It Had To Be You, Don't Get Around Much Anymore, The Girl From Ipanema, Say A Little Prayer, I've Got You Under My Skin, Dream A Little Dream Of Me, Sway, That's Amore and many more ! Thank you so much for playing at our wedding on 18 March at Largs Bay Sailing Club. We received such lovely feedback about your music from so many of our guests. You read the crowd really well. Your choice of tunes, the volume and quality of your beautiful playing set the whole mood for the rest of the evening which was a great success. Thank you so much Ken. We'll be more than happy to recommend you. He catered to all of our requests and was super prompt with his communication. His performance on the day was stunning. Couldn't have asked for more from Ken."